Our mind consists of thoughts that repeat on a daily basis. These thoughts affect our actions and as a result, affect the outcome or results we experience. If you think the same thoughts every day, you get the same results as yesterday. To achieve a different result you need to change your thoughts. Changing your thoughts is sometimes called reprogramming your mind. You ask how to reprogram the mind for success, but I believe this question is a misnomer. Using the word reprogram means that you want to change the program or rewrite it from the beginning. I believe that our mind already contains the programming necessary to achieve success, we simply need to debug it. Debugging your mind means getting rid of the bugs that cause errors in your thinking that sabotage your efforts at success. These bugs include the thoughts that make you doubt yourself, procrastinate, afraid to take a calculated risk, and other habits and beliefs that get in your way. Instead of writing another program on top of the one you use right now, you can simply eliminate the errors in your current program to pave the way to success. In programming, you know you have bugs in your program when it results in an error. The way to get rid of those bugs is to clearly identify them and then replace them with the correct programming. The difference between computer programming and mental programming is that in computer science, you know the outcome you want to achieve. The bug is easier to discover and repair because you are clear about what the program should do. Therefore, to eliminate bugs in your mental programming, it’s necessary to identify the outcome of what you want to achieve. It’s easier to know what’s wrong for a specific output than to identify an error for a general outcome. Instead of asking how to debug the mind for success, choose a specific outcome, like public speaking. 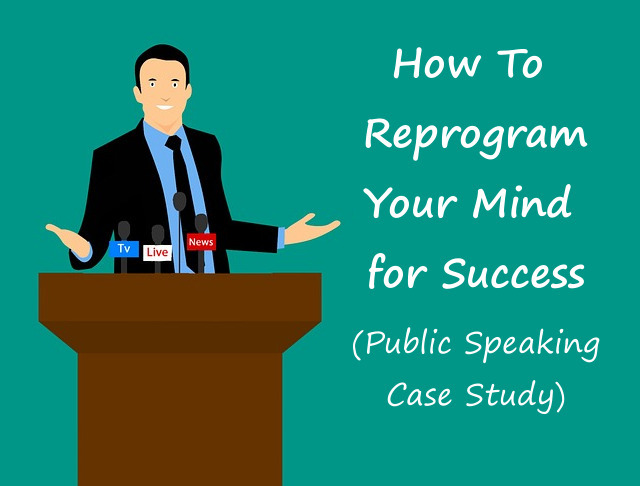 The question then becomes how to reprogram or debug the mind for public speaking, which is a much easier problem to solve than debugging for overall success. The poster wasn’t asking how to deliver a useful speech, he was asking how to make people like him. He was using one program (how to make people like him) to achieve the outcome of another program (how to give a useful speech). Of course that would cause problems, because they conflict with each other. It’s not impossible to give a useful speech and have your audience like you, but making people like you isn’t the goal of the speech (unless you’re a politician). The goal of the speech is to send a message, regardless of whether people like you or not. The bug here is that focusing on his self-image gets in the way of him delivering a useful speech. Instead of thinking how to most effectively communicate his ideas, he is thinking about how to make people like him. Interestingly, defending your self-image is a common bug that causes errors in other areas of life, such as communicating with your partner, selling products to your customers, and getting things done. I’ve talked about how protecting your self-image becomes a “meta-goal” or secondary goal that gets in the way of your primary goal and stops you from achieving success. In the case of public speaking, we identify that the bug causing the error is focusing on self-image instead of focusing on effective communication. Once we understand that, it’s a simple process to change our attention to communicating effectively and not have the goal to make people like us. From the case above, you can see that building understanding is the correct solution. Identifying the self-image bug is part of taking inventory of what we know to build an understanding of the problem. The beauty of understanding is that once you do it, it’s impossible to not understand. It’s a permanent solution. There are tools people mention that help to “reprogram” the mind, such as visualization, meditation, affirmations, and hypnosis. These tools can work to some degree, but they don’t always result in a permanent solution. If you manage to achieve change by using these tools, there’s a possibility that you fall back into your old patterns of habits and beliefs. That said, those tools can be powerful combined with correct debugging of a problem. In the case of public speaking, you can say affirmations to remind yourself about what you should focus on, such as “I communicate effectively.” You can also visualize a speaking session where you communicate well and the audience understands your message. The power of these tools become multiplied when you apply them to the correct problem that’s in your way. You can achieve change and results faster when combining identification of the bug, and using your favorite technique. Without knowing the true problem at the root, these techniques will be less efficient, and make you think they don’t work. Remember though that the first step is to state the outcome. It’s difficult to answer how to reprogram your mind for success if you don’t define what success you want. I hope the public speaking example can give you a guide to solve your particular issue. But if not, you can leave a comment below and we’ll try to debug your problem correctly. Free Wealth Events this Summer!